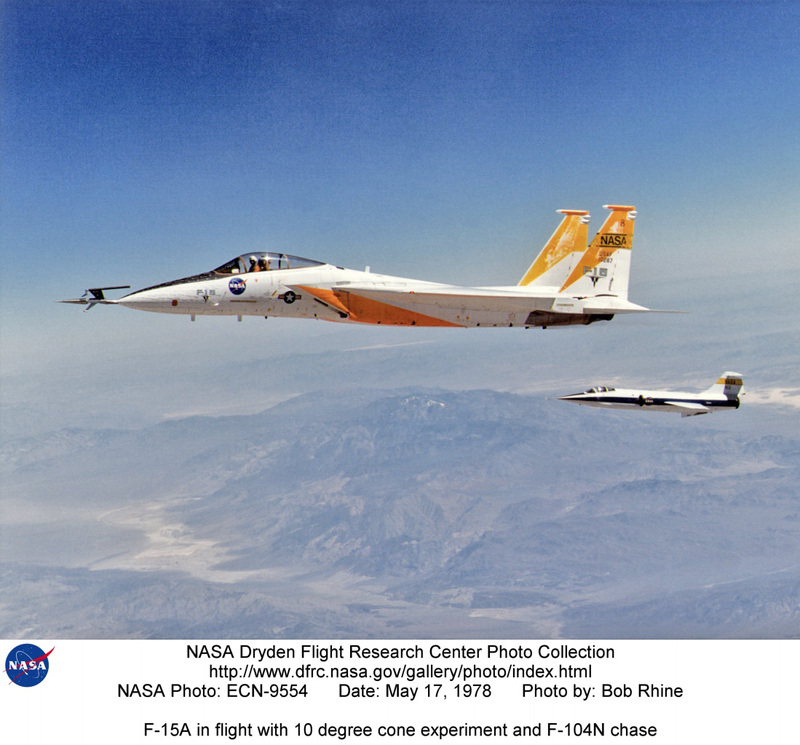 Description: An in-flight photo of the NASA F-15A used to carry a 10 degree cone to collect aerodynamic data to calibrate the data from wind tunnels. the flight was made on May 17, 1978. 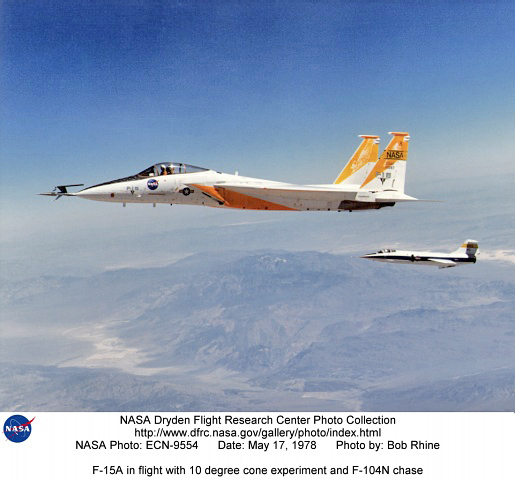 Acting as chase for the flight was a NASA F-104 aircraft. Description: This NASA F-15 was the first aircraft to demonstrate a fully integrated inlet-engine-flight control system, a self-repairing flight control system, and a propulsion-only flight control system. The F-15 was designed as a single-seat, twin-engine air superiority fighter by McDonnell Aircraft Co., McDonnell Douglas Corporation, St. Louis, Missouri. The F-15 is normally powered by two Pratt and Whitney F100-PW-100 or 220 engines, depending on the model. The NASA F-15 was equipped with advanced versions of the F100 -- F100 EMD (engine model derivative). The aircraft was capable of flying more than twice the speed of sound. The F-15 is 63.75 feet long and has a wingspan of 42.83 feet. This NASA F-15 was extensively modified for research activities and did not carry any armament.